MANILA, Philippines – The results of February 2019 Master Plumber board exams including the official list of passers, top 10 examinees, top performing schools and related announcements are available at this website as the Professional Regulation Commission (PRC) releases the results online two (2) working days after the last day of board examination. As annnounced, 282 out of 837 examinees passed the exams. The licensure exams are administered by PRC Board of Master Plumber headed by its Chairman, Engr. Valentino M. Mangila, and its members Engr. Pedrito D. Camilet, Jr. and Arch. Prospero A. Abellano on February 12-13, 2019 at PRC testing centers in Manila, Baguio and Iloilo. As per Resolution No. 1127 series of 2018 entitled "Schedule of Licensure Examination for Year 2019", the target release date of Master Plumber board exam result February 2019 will be in two (2) working days after the last day of board examinations or by Friday, February 15, 2019. However, results may also be released earlier or later than the target date without prior notice. On the same board exams administered by PRC on July 2018, February 2018, July 2017 and July 2016, results were out after three (3) working days. The schedule of online appointment for issuance of Professional ID and Certificate of Registration will be from February 27 to March 1, 2019. PRC is strictly implementing the online registration system for all passers effective March 30, 2016. Initial registrants are advised to register online via http://online.prc.gov.ph, an online application and registration portal of PRC. In the most recent Master Plumber exams conducted on July 2018, 626 out of 2,514 examinees passed. Nhel Adrian Barbosa Bartoline from Eastern Visayas State University Tacloban ranked first in the exams garnering a rating of 81.70% followed by Charlston Encabo Redulosa from Cebu Institute of Technology University having 80.70%. Here's the complete list of topnotchers for July 2018 Master Plumber board exams. Meanwhile, none qualified in the top performing schools. During the Master Plumbers exams on February 2018, 429 out of 1,064 examinees passed. Edmond Intac Rocamora from University of the Philippines - Los Baños ranked first in the exams garnering 81.80% rating followed by Wilbert Guinto Hernandez from Bulacan State University - Malolos having 81.10%. UP Diliman was the top performing school having 86.67% overall passing rate followed by Pamantasan ng Lungsod ng Maynila having 80.00%. On July 2017 exams, 798 out of 3,141 examinees passed. Kim Aldrin Sarra Mejia from Mapua Institute of Technology - Manila ranked first in the exams garnering 82.20% rating followed by Richard San Luis Garcia from Technological University of the Philippines - Manila having 81.60%. Malayan Colleges Laguna was the top performing school having 85.71% overall passing rate followed by University of the Philippines - Diliman having 82.76%. Below is the table showing the number of examinees, total number of passers and overall passing rate in the last seven (7) exams of Master Plumbers, courtesy of PRC. The next schedule of Master Plumber board exams for the Year 2019 will be on July 6 & 7, 2019 in the cities of Manila, Baguio, Cagayan de Oro, Cebu, Davao, Iloilo, Legazpi and Tacloban. The online processing will start on March 6, 2019 until June 6, 2019. You might also want to know the tips on how to pass the PRC board exams. Get it from the previous examinees and passers. 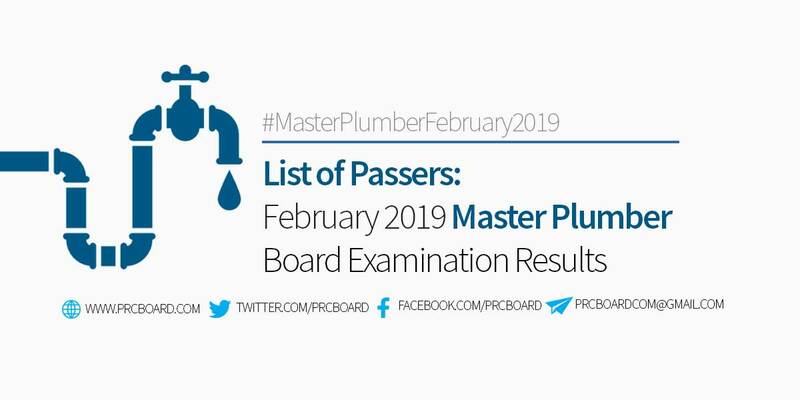 To receive up-to-date news on Master Plumber results for February 2019, we advise our visitors to bookmark this page, visit PRC official website or follow us at our social media pages via Facebook and Twitter.